If you’re new to making jam, this homemade orange marmalade recipe is a great place to start. My son watched Paddington not too long ago and has been talking about marmalade ever since. In the movie, the bears not only pretty much live off of orange marmalade sandwiches, but there is more than one scene where they make it from scratch. Obviously, I had to dust off my old homemade orange marmalade recipe and knock his socks off. He basically thinks I’m a magician now, so mission: accomplished! Jam-making might seem a bit daunting, but don’t let this orange marmalade recipe intimidate you. There are a lot of steps involved, but none of them are hard. If you can chop, boil water, and stir things, you can do this. 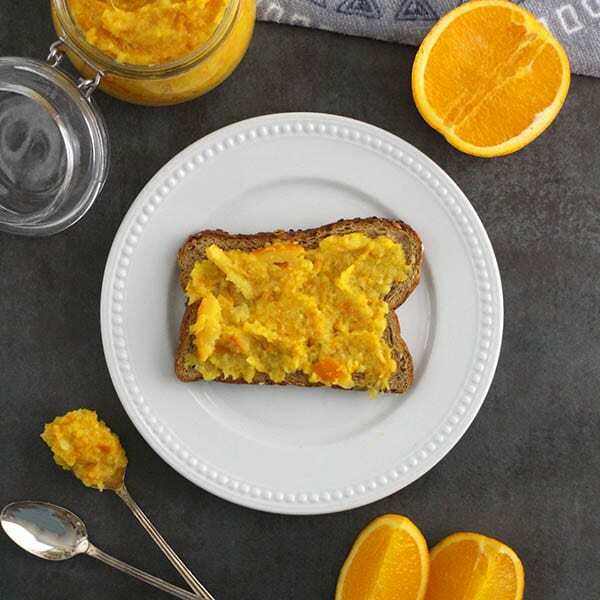 This recipe is adapted from Patricia’s Meyer Lemon Marmalade that she posted at Eat Drink Better. It’s simple, and the results are a delight! Slice the juiced oranges into strips. Boil the orange strips with the juice and some sugar. Orange Slices, Ready to Cook Down into Sweet, Sweet Marmalade! That’s it! To make it this recipe accessible to a 5-year-old’s attention span, we played a board game in the kitchen to occupy us while we waited for things to boil and cook. He loved juicing the oranges, watching the marmalade’s progress as it cooked, and using the immersion blender to thicken the finished product. 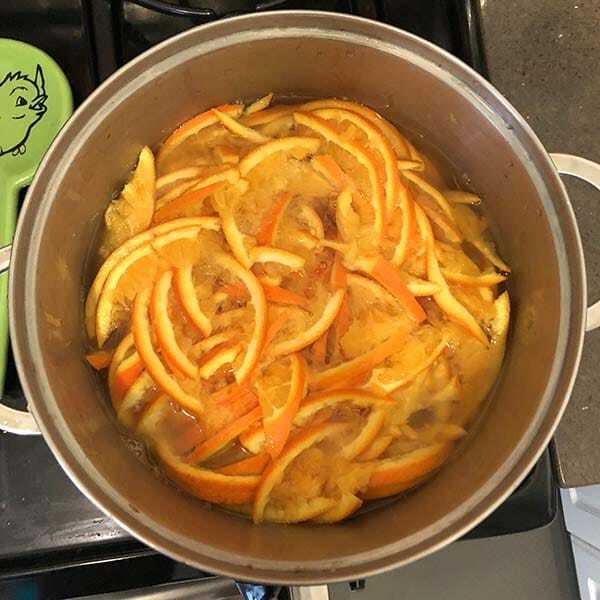 This recipe does not use a hot water bath, which means your orange marmalade needs to be stored in the refrigerator, and you need to eat it within a few weeks of making it. If two pints seems like a ton of marmalade to eat in about a month, I encourage you to share the love! Have a jam-making party with a friend, and split the goods. Or gift a half- or full-pint to someone special. 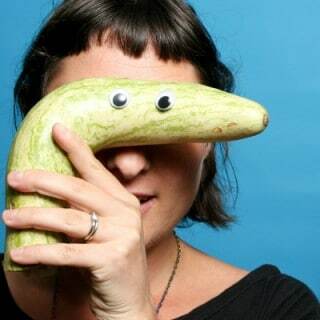 They’ll think of you every time they use it on their toast. If you're new to making jam, this homemade orange marmalade recipe is a great place to start. Halve your oranges and juice them into a large bowl, then set the bowl aside. Slice the juiced oranges into the thin strips - 1/4" to 1/8”, discarding the woody top (the part where the stem and leaves would be attached). Put the orange slices into a large pot and cover with water. Bring them to a boil and let them boil for one minute. After that minute’s up, dump them in a colander, rinse, and repeat this process once more. Place the rinsed orange slices back into the pot, add the sugar and the juice that you reserved, and bring them to a boil one final time. Reduce the heat to medium and boil, stirring occasionally, for about 45-55 minutes, until the mixture reduces in half. It will be thick but not marmalade thick yet. Your marmalada will thicken when you purée in the next step and as it cools. 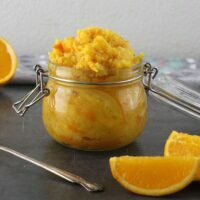 Use your immersion blender or transfer the (cooled) goods to an upright blender and pulse to break up the orange peels until you’ve got the texture that you like. Chill until you're ready to serve. Your orange marmalade will keep for 3-4 weeks in the fridge. 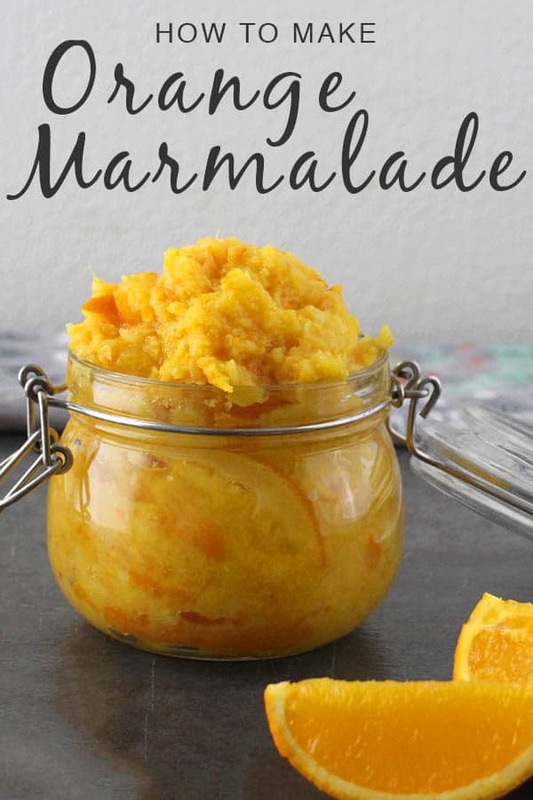 This recipe yields around 2 pints of marmalade, which is about 32 2-tablespoon servings. Ooh the lemon marmalade would be so good with that cake. If you try it out, let me know how it goes for sure!